...to get some things accomplished this week. My table is under several piles, and I still have so many things to get ready for the craft fair. It's beginning to get discouraging when I think of all the work that is goin into it and the small return I can probably expect. I hope I will be surprised, but I won't be holding my breath. Soccer is winding down, and Jonathan's team seems to be getting worse rather than better. Most times, the coaches are doing a good job to keep them on the field and getting the kids headed toward the right goal seems to be a real accomplishment. Here's a photo just to show how the teams really mean nothing. It's pretty much every man for himself. 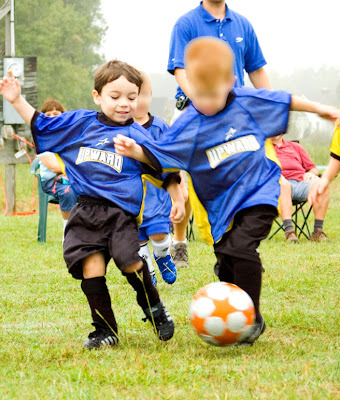 I don't like to post pics of other people's kids without their permission, so that's why it's blurred out. Also, I guess the coin landed on buy--just not that house. We started looking in a few areas where we hadn't looked before, and we found another house we like. It still only has 2 beds and 1 bath, but it has some unfinished space upstairs and a lot more living space. We'll keep you all updated, and we might be looking for some helpers come mid-November. It's about the same distance we are now from the church, but it's in a different direction.